Dr. Sam Christian: "Dominica owns me"
Like a man who came back from the grave, Dr. Sam Christian returned to Dominica from medical treatment in Martinique Saturday to tears of joy, songs of praise, words of wisdom, and many kisses and tight hugs and fist bumps. Coming from the L'Express des Iles ferry on the Dame Eugenia Charles Boulevard in the blazing midday sun, Dr. Sam walked with the help of a cane; Edincot St. Valle lifted him up from sitting positions; and he rode in a wheel-chair as Matt Peltier of Q95 FM interviewed him for a live radio show. During a short ceremony held under a make-shift tent on the sidewalk, organised by the opposition United Workers Party (UWP) Dr. Christian spoke about his unusual experience after a freak accident at Pointe Michel on Saturday 1st December 2018 when the SUV that Dr. Christian was driving rolled over him shortly after he tried to exit or enter the vehicle. He suffered a broken pelvis and severe damage to major organs. "I told Danny I was not coming back to a Workers (UWP) event; I was coming back to a Dominica event; I am coming back to speak about national unity and reconciliation," said Dr. Christian who before the accident was actively campaigning to become the UWP parliamentary representative for Pointe Michel, Soufriere, Scotts head and Galion at the next general election. During his short speech at the function, Dr. Christian said after the accident he'd bleed extensively internally "in my back, and my thighs and my hips, what in medicine we call retroperitoneal bleeding". "When every last drop of my blood was poured out I received more and more blood and the blood just kept going out," he said. "For three months I had the blood of other Dominicans in me. None of my own blood but whether it was Labour, or Freedom or Pappy or Jehovah Witness – so anybody's blood was in me. So Dominica owns me." 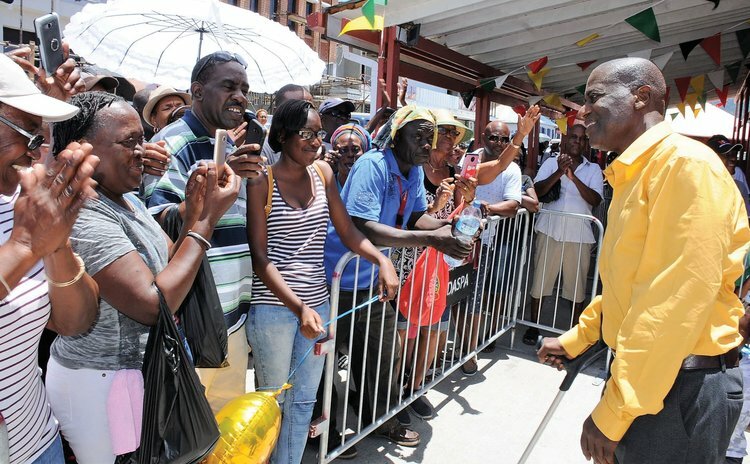 At the function, opposition leader Lennox Linton said when he visited Dr. Christian at a hospital in Martinique, he saw someone who never gives up. "This was not going to be an easy journey to recovery," Linton said he thought. "However, the person on the journey was a fighter, a soldier of rare quality, someone who never says die." "Your presence here today is a testimony of your inner strength, your conviction, your desire to make a difference in the lives of Dominicans," said Dr. Irving Andre, the Dominican author and Canadian judge. Learning from his experience Dr. Christian said he was forming an organisation to assist people who would need emergency operations in Martinique and to assist Dominican doctors to utilize telemedicine to help their patients.